Wafcol Light Salmon and Potato Adult Dog Food has been formulated to be gentle on sensitive digestive systems, using salmon as the single protein source and potato as the main carbohydrate. This highly palatable dog food contains a prebiotic to help strengthen the immune system, reduce digestive upsets, remove harmful bacteria and promote maximum nutritional uptake. 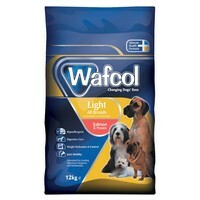 Containing 50% less fat and fewer calories than many adult diets, Wafcol Light Adult Dog Food offers a weight reduction diet that fulfills all the requirements of an adult dog. Including oils and minerals which promote an efficient anti oxidant system, which provides joint support and Omega 3 & 6 fatty acids and zinc to promote hair growth and coat condition, Wafcol Light is a superb option for the canine in your life. Salmon (24%), Potato (24%), Whole Lupins, Potato Starch (10%), Seaweed (3.5%), Salmon Meal (4%), Salmon Digest, Minerals, Vitamins, Salmon Oil, Sunflower Oil, Mannan-Oligosaccharides (2150mg/kg), Fructo-Oligosaccharides (2150mg/kg), Glucosamine (680mg/kg), Methylsulfonylmethane (680mg/kg), Chondroitin (480mg/kg). Crude Protein 21%, Fat Content 6%, Crude Fibres 4.5%, Crude Ash 8.5%, Calcium 1.1%, Phosphorous 0.9%, Omega-3 Fatty Acids 1.6%, Omega-6 Fatty Acids 2.7%.